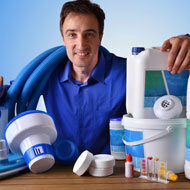 Las Vegas Pool Service can clean pool tile very effectively with what is know as mineral salts. Other pool companies use glass and crushed beads but these can harm your pool equipment and filters and we would rather not take that risk with your pool! 1. We Are Trained To Clean Your Pool Tile. Don’t just hire anybody to clean your tile! We know what it takes to safely remove all calcium deposits while also not scratching or causing damage to your tile and grout. 2. Why Do We Use Mineral Salts? They are more expensive than glass or beads but they are also softer than your tile. This results in no pitting or inhalation hazards from our solution. It also will dissolve in your pool within 24 hours. 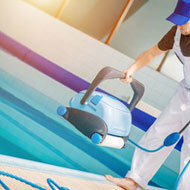 We can easily clean it while vacuuming your pool and it will not cause damage to your pool pump or equipment. 3. Our Process For Cleaning Your Pool Tile Explained. We use a power washer with a special nozzle and are able to run the special mineral salt solution through the wand to clean all calcium off of the tile and grout with absolutely no damage. If glass or beads are used then you will have small pits on your tile which will also make it easier for calcium to adhere to your tile later on. 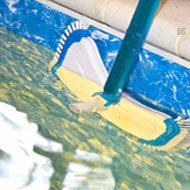 Our solution is also safe to be vacuumed through your pool pump and filtration equipment. We will apply wax after cleaning and polishing so that the water will bead off of your tile and stay clean longer. if you need your pool tile cleaned by a true professional who looks out for your best interests, then the Las Vegas Pool Service company will get it done quickly and with no hassle! Give us a call today so we can get your tile looking brand new.